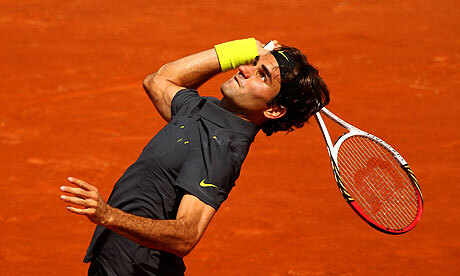 Roger Federer advanced to the 2nd round in Paris with a 62 75 63 win over German Tobias Kamke. It was Roger's 50th win at Roland Garros and his 233rd win at a major, tying him with Jimmy Connors. Fed next plays Romanian Adrian Ungar, who upset David Nalbandian in four sets. It was not a superb performance by Roger, as he hit 38 winners to 47 unforced errors, but in the 1st round, a win is what mainly matters. He broke twice to win the first set and then went down a break in the second after some sloppy play, but then turned it around in time to win 5 of the next 6 games to take the second 7-5. The third set was comfortable and had match points at 5-1 on Kamke's serve but could not convert. He then got broken for the 3rd time on the day, but then broke right back to take the set 6-3, and thus, the match. I'm sure Roger would have rather played a cleaner match, and he would have liked to have done things differently, but in the end, a straight sets win is a straight sets win. Kamke was smashing the ball and going for broke (the only way he would have any chance at all) and it paid off for him as he gave Fed a little bit of trouble. Still, it is the first round and Roger was obviously not playing with 100% intensity that he does in the later stages of Slams. More important than the win was that he equaled Connors' record of 233 match wins in Slams. That is absolutely an amazing accomplishment considering Roger is only 30. Jimmy was in his 40s when he got his 233rd match win at a Slam. At this rate, Roger could easily add to his total and further the mark tenfold. In a scenario where he makes all four semis at the majors, that is 20 wins a year, so he could easily push the 300 win mark by the end of his career. Novak Djokovic, Jo-Wilfried Tsonga, Tomas Berdych, Juan Martin del Potro, and John Isner all advanced to the 2nd round. Tsonga and Delpo had to win in 4 and Djokovic was pushed in the first set against Potito Starace before racing to the finish line in the final two sets. Gilles Simon (11), Fernando Verdasco (14), Stan Wawrinka (18), Milos Raonic (19), Marcel Granollers (20), Marin Cilic (21) Philipp Kohlschreiber (24), Andreas Seppi (22) , Bernard Tomic (25), Viktor Troicki (28), and Kevin Anderson (31) were the other seeds to advance. Anderson saved four match points before winning 11-9 in the fifth set. Alexandr Dolgopolov was down two sets to one and won the 4th before play was suspended. Play on Tuesday will feature Rafael Nadal, David Ferrer, Janko Tipsarevic, Juan Monaco, Richard Gasquet, and the conclusion of two matches, Tommy Haas vs Filippo Volandri and Dog's 5th set vs Sergiy Stakhovsky.